What exactly would you expect to hear at a metal show? Considering the sheer abundance of sub genres that metal has been sliced into over the years, bands are usually billed in a “like with like” fashion. 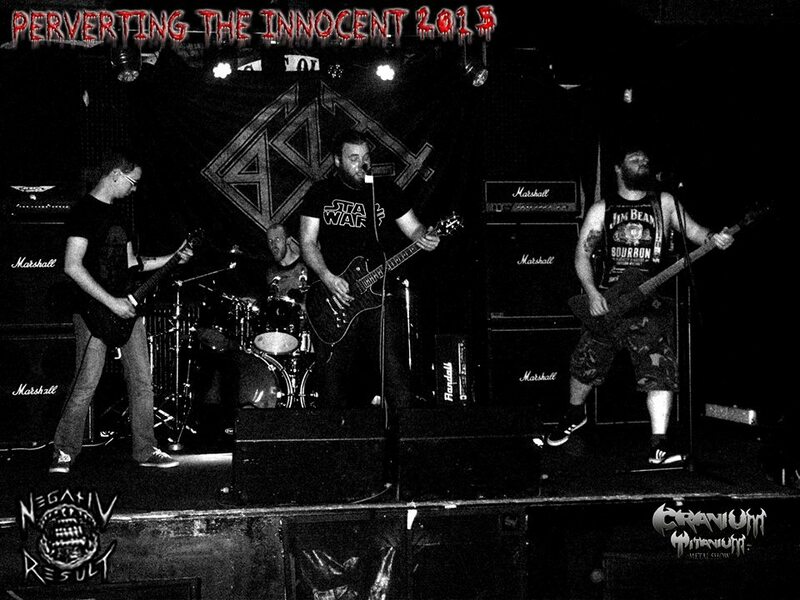 Thrash bands support fellow thrash bands, doom follows doom and punk acts perform with other punk acts. However, on a rainy night in Galway City’s Seven Bar, that loosely written rule book was flung from the window of a moving vehicle as a number of Irish and German bands came together to perform a gig that would span a whole host of different styles, all proud to be under the wide umbrella of metal. The ‘Perverting the Innocent’ warm-up gig was a perfect chance for these bands to dust off the cobwebs and fine tune their sets in front of a live audience before their main show in Dublin the following weekend. The show began with a blistering set from the only home town band on the bill. 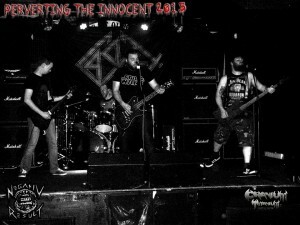 Galway’s aggressive three piece outfit, NEGATIV RESULT opened up with a barrage of fast paced, brutal tracks. They boasted a heavy, detuned, bass driven sound which produced an air of grit to their guitar work. This was beautifully accompanied by lead vocalist, Brendan’s, gravel ridden voice erupting from within the depths of his large frame. The band’s sound and pacing seemed similar to that of SEPULTURA or MACHINE HEAD, switching between fast thundering passages and slow steady grooves. Although these alternations fit NEGATIV RESULT’s style perfectly, their real power lay within their slower passages which were comprised of ground rupturing punches, forcing the audience to sway to their every command. Interestingly, scattered throughout these monstrous blast beats and enormously weighty riffs were occasional bouts of soft, melodic vocals. These sections threw a satisfying curveball into their overall hefty assault; temporarily changing the tempo and adding a different flavour to the mix. However, this lighter approach never overstayed its welcome as each track came crashing back into NEGATIV RESULT’s freight train style. 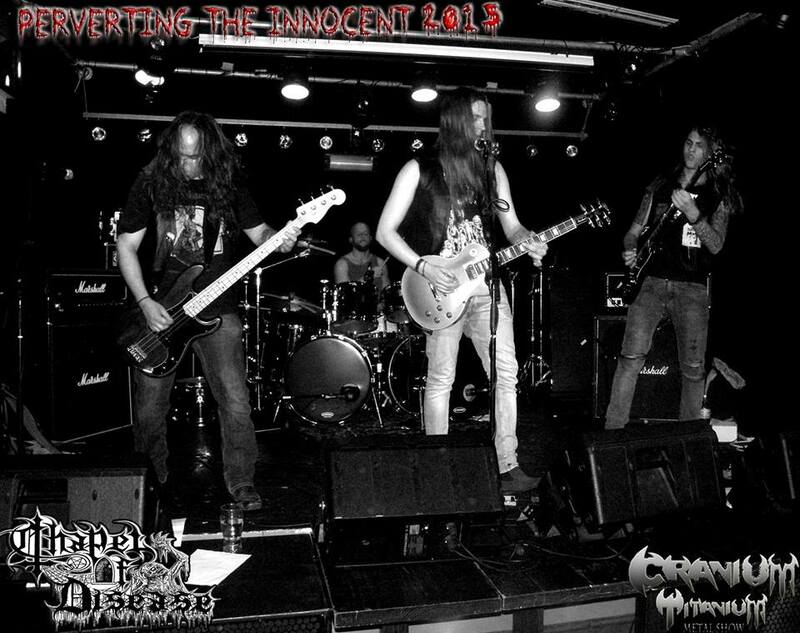 NEGATIV RESULT’s set was followed by long running German death metal band, CASKET. Also sporting a three piece line up, CASKET provided one of the more interesting on-stage presences of the evening. 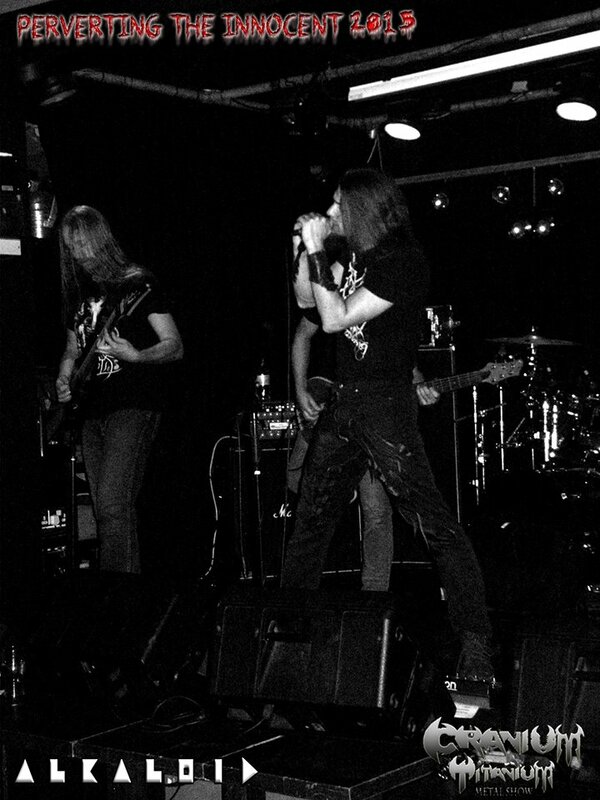 On the right stood vocalist/guitarist, Schorsch, rigid as stone while waves of long blonde hair concealed his face from the crowd, giving him a mysterious and dangerous persona. To his left, bass player, Susi Z, was embroiled in a perpetual state of movement, dancing to the full and heavy sound being expelled from the amplifiers. This act brought with them a deep, but surprisingly clean guitar sound, making their riffs easy to digest for first time listeners, but still giving them enough weight to supply veteran fans with something to really sink their teeth into. The vocals on display here from the enigmatic front man achieved such incredible depth that they caused members of the crowd to feel their skin rumbling. Hitting notes so low they seemed almost supernatural in origin, Schrosch’s voice was pure, unadulterated force. Supported by Marinko’s amazingly accurate drumming with some standout double bass drum work throughout their entire set, CASKET provided Seven Bar with a rock solid performance. SYPHOR took to the stage, hot on the heels of CASKET’s wave of destruction to add yet another form of metal to the brutally heavy show. Based in Dublin, SYPHOR delivered a much more light hearted performance through a unique mix of a lightning fast thrash and melodic death metal. Fronted by the ever energetic Dan Golding, this five piece act’s material was constructed into a more simplistic song structure than their predecessors’, featuring some great moments of duelling guitars from Franco Buonocore and Dave O’Rielly; each bringing their own personalised sound to the band. The harmonies on show here were incredibly tight and gave way to perfectly orchestrated solos which completed the tracks, elevating them to the next level of melodic death. The raspy, high pitched vocals were akin to such greats as Arch Emeny’s Angela Gossow as Golding dominated the stage; often jumping into the crowd to create some turbulence. It was clear that SYPHOR enjoy what they do. There were countless times during their set that were the band members could be seen playfully pushing each other and joking around, mid-song. This feeling of camaraderie peaked during some of the set’s designated long notes, as each standing musician would sway in perfect unison before exploding back into a frenzy of head banging. SYPHOR’s set was an enjoyable bout of high energy metal. Just after the halfway point the night took a bizarre and interesting turn in the form of SHARDBORNE. Deep in the centre of an incredibly heavy line-up, this Limerick act were more than happy to change the pace to suit their own needs. 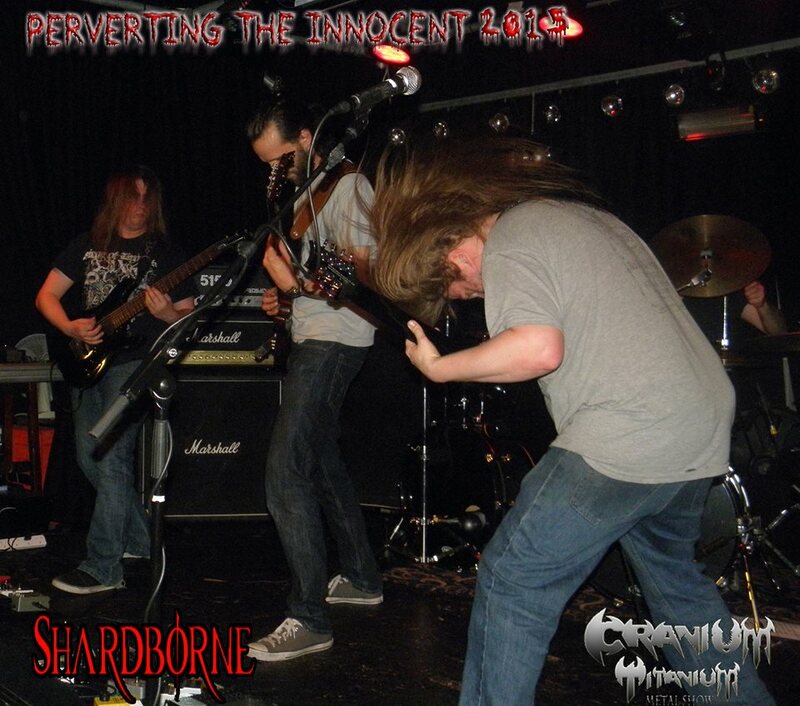 A hugely technical outfit, SHARDBORNE fall under the guise of progressive metal, featuring a wide sweeping instrumental sound which subtly builds over time; constructing a magnificent tower of musicianship. Time itself is a vital keystone in SHARDBORNE’s existence, as each riff calmly plays out to its full extent, often to an almost psychedelic extreme. Layer by layer guitarists Eoin and Ciaran Culhane compliment each other’s styles fantastically as they envelope their riffs around Cormac O’Farrell’s fantastic six string bass lines. With hints of Rush, Joe Satriani and even Spastic Ink running through their complex music, it often comes across more like prog rock than it does prog metal. However, while their circling riffs, jaw dropping solo work and incredible use of effects pedals may spend most of their time in a state of hard rock, they do occasional drop back into the realm of metal with forceful rhythmic chugging, supported by marvellous rippling bass drum work from Ben Wanders. Things shifted back in favour of a heavier musical taste following SHARDBORNE’s set with the arrival of Germany’s CHAPEL OF DISEASE. You’d be forgiven if you were fooled into believing this Cologne based act were a 1970s rock band, judging by their exterior. Long straight hair, blue jeans, black t-shirts and waistcoats seemed to be uniform for this four piece. However, their musical style was actually grim combination of doom and death metal. Ferociously fast strumming, backed by equally fast drumming, pushed their material along at a blistering pace. Laurent T.’s flurry of short, but razor sharp, guitar solos screamed of Slayer’s Kerry King while the rest of the band solidified a much darker tone to their sound. It wasn’t all full speed ahead here though, CHAPEL OF DISEASE were in complete control, delivering lenghty vacuums within the tracks as they saw fit. Long, steady build-ups swelled from the feedback and left the crowd desperately waiting, almost begging, for the blast beat before releasing another continuously solid beating. Bizarrely though, behind the constant waves of sonic assault and demonic vocals, there is still a hint of ‘70s heavy metal to be heard lurking in the background. The suspense brought across by their slower sections, and the haunting sound that was ever present throughout their set seemed to be heavily Black Sabbath influenced. This gave CHAPEL OF DISEASE a uniquely interesting spin on the death metal genre which was reminiscent of a simpler time. While the crowd were still reeling from the CHAPEL OF DISEASE’s deathly serious aural onslaught, the evening’s headlining band took to the stage for their live circuit debut. Sporting an elite ensemble of death metal veterans, ALKALOID featured talented musicians from such extreme metal acts as GOD DETHRONED, DARK FORTRESS and ABORTED, creating something of a super group in their field. However, this design acted as much more than just a sum of its parts. Taking the speed and aggression of death metal and mixing it with the atmospheric pacing of prog, ALKALOID produced a very unusual style which demanded the crowd’s through crushingly heavy passages attention while simultaneously producing a weightless air, filling Seven Bar with a sense of mystery. 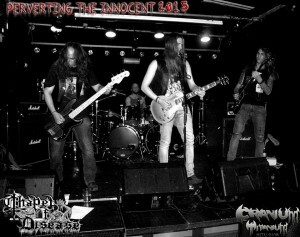 Their songs unravelled around the crowd, captivating them in this incredible progressive world before dragging them back into a dark whirlwind of death metal. With the imagination of Tool mixed with intensity of OPETH and the suspenseful ambience of NEUROSIS; ALKALOID have given an age old genre a new twist. It seems unfortunate, however, that their set was ravaged with a number of technical difficulties. At first there was a lengthy delay as they tweaked their gear to optimize their performance. Due to these difficulties the band were left one guitar short of their three guitarist line-up as lead singer, Moreon, appeared to have trouble with his equipment. This was followed by a restart after the intro to their opening track which, in turn, called for more delays; this time the problem came in the form of Hannes Grossman’s drum kit. These issues persisted throughout the performance. Although Alkaloid played an amazing set, creating a phenomenal marriage between death and progressive metal, they seemed somewhat drained and never quite recovered from the technical problems. However, this being their debut gig, and being a warm-up for the pending Perverting the Innocent show on Ireland’s east coast means that this was the perfect time to work out those last minute kinks and tighten up their sound before bringing it across the country.